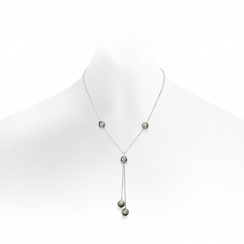 A popular and versatile style of necklace that will suit almost any neckline or occasion, with peacock green Tahitian pearls dropping elegantly from an extendable sterling silver chain. The shape of the lariat is believed to be named after a cowboy's rope lasso, which would be knotted at one end. 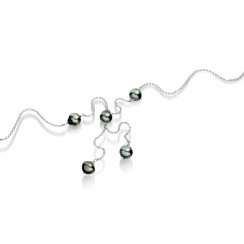 With this design, five saltwater Tahitian pearls are suspended from a standard 45cm length silver chain, with an additional 5cm of chain next to the clasp at the back for the wearer to vary its height if preferred. The two lowest pearls dangle freely a maximum of 8.5cm from the centre. 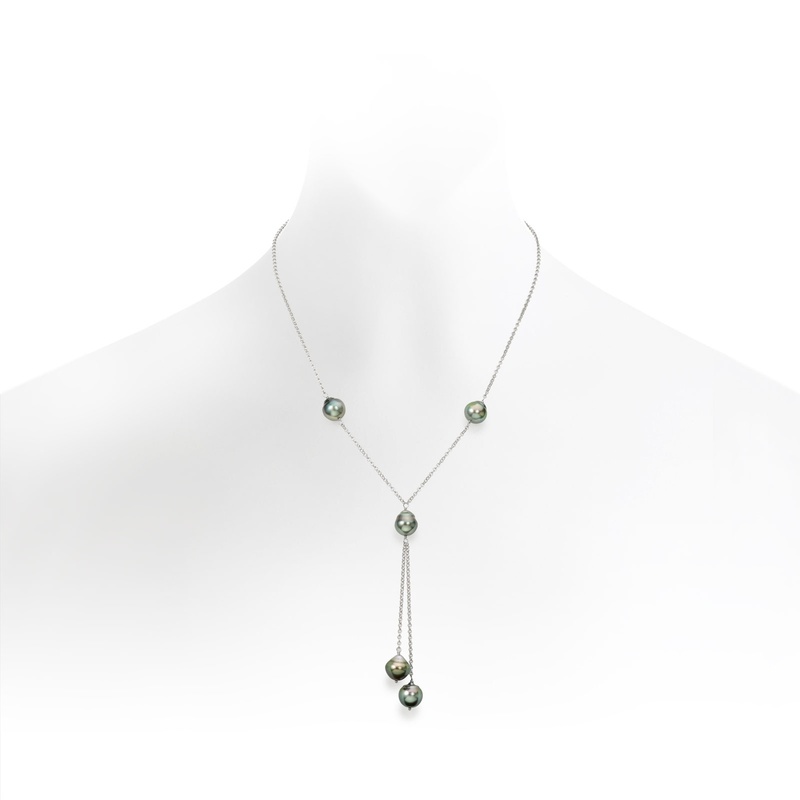 The lariat is made with cultured Tahitian pearls, which are grown in oysters in the warm saltwater of the South Pacific and French Polynesia. We have carefully selected these pearls, looking at the shine of their lustre and their light grey, green and peacock colours. The 9-10mm diameter pearls are of a noticeably irregular appearance, which means that they will have some minor imperfections and characterful circles present on the surface of the pearl. 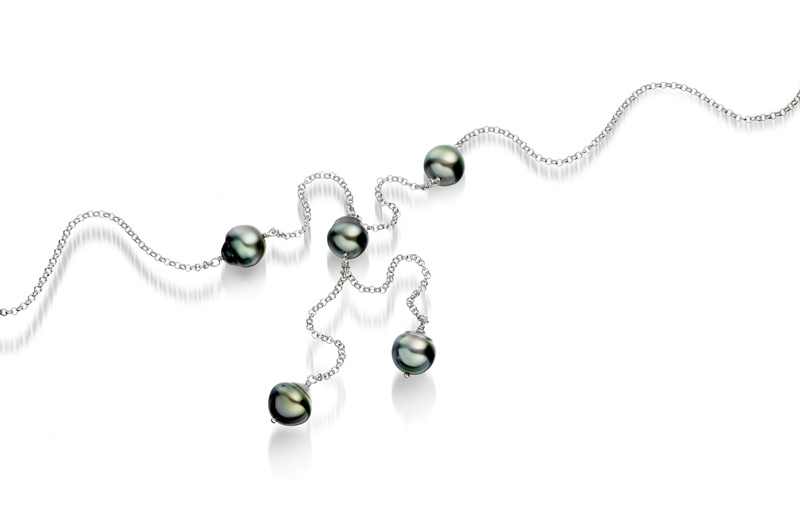 This baroque shape is quite normal, particularly with cultured Tahitian pearls, and adds to the charm and individuality of the necklace. This style of necklace is also available with a matching set of pearl drop earrings. Product : Beautiful individual pearls. Reply Thank you very much for your kind feedback. We are delighted that you chose an anniversary gift from Winterson and hope that the necklace was perfect. If we can hep in any other way, please do let us know. Service rating : very speedy dispatch, packaging very good including gift wrapping. Everything was handled well, the packaging was excellent and the delivery was very quick. Professional.